I have a very dry sense of humor and I rarely laugh out loud. I attribute this to my upbringing in an extended family full of folks who use satire, irony and snideness (is that a word?) in their everyday language. It’s our family’s way of showing affection. Staring at the monitor until something comes to me, discarding the obvious caption (usually the first thing that comese to me) and waiting for something not so predictable to come into my head. Sometimes this is an excruciating experience. Are you planning any modifications to the website? It would be nice, for example, to be able to have an archive of winning entries. I have many big ideas. I also plan to organize the garage. Right now, I'm going to make a sandwich. Actually I'm hopeful further development efforts will be picking up very soon. I love www.awkwardfamilyphotos.com and for the adults in the crowd, http://textsfromlastnight.com. “Funny” is in the mind of the reader. Some prefer cornpone humor; others get a kick out of puns. 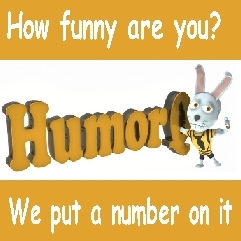 I’m not a fan of sophomoric humor but I realize there are a lot of folks who laugh at loud at what I consider “teenage idiocy.” For me, HumorQ is not about being the funniest; it’s about challenging myself to be creative every day.